Logistic mini C.B.S. supplied with 2 telephone interfaces (1 data channel and 1 GSM channel) and predisposed to manage a single operator desk. It's suggestable to use this system in co-operation with an higher level C.B.S. which takes care of security and configuration aspects. 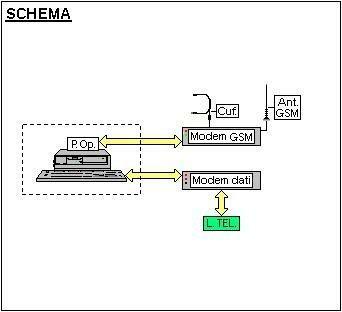 The structure allows to manage up to 3 different telephone interfaces (1 voice channel, 1 data channel and 1 GSM channel). Logistic C.B.S. predisposed to manage one operator desk PC.